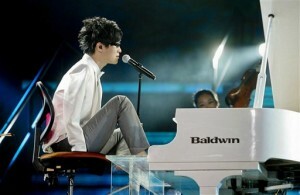 A musician who lost both arms in a childhood accident and plays the piano with his toes has won “China’s Got Talent,” performing his version of James Blunt’s wistful love song “You’re Beautiful” to a packed audience at the Shanghai Stadium, according to the Associated Press. For winning the Chinese version of the show that helped make Britain’s Susan Boyle a singing star, Liu will be invited to play as a guest performer with Taiwanese singer Jolin Tsai. He also has the chance for a performing contract. Liu’s arms were amputated after he suffered an electrical shock while playing hide-and-seek when he was 10. At age 18, he decided to pursue a career in music, using his feet to play the piano, much as he uses them to navigate on the computer, eat, dress and brush his teeth. The program, which began in July, is part of British recording executive Simon Cowell’s “Got Talent” franchise, which now has versions broadcasting in more than 30 countries.